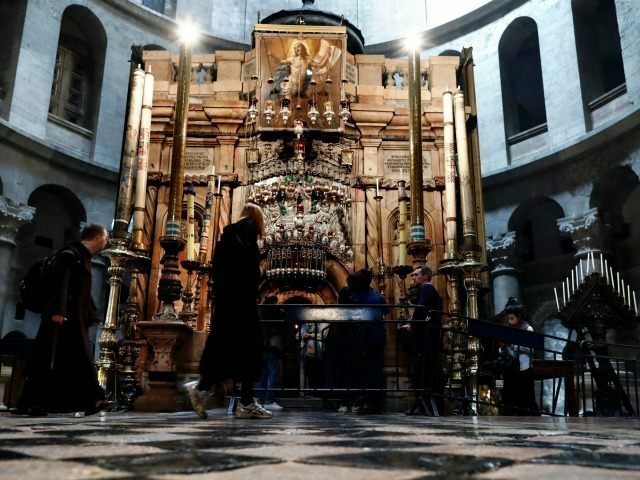 JERUSALEM (AFP) – The tomb where Jesus is said to have been buried before his resurrection in Jerusalem’s Church of the Holy Sepulchre is to undergo major restoration, church officials said Wednesday. The work could begin soon after Orthodox Easter on May 1. Western Christians mark Easter, which celebrates the resurrection of Jesus, this coming Sunday. The restoration, entrusted to a Greek team, is expected to be completed in early 2017 and the site will remain open to visitors in the meantime. The shrine, several metres tall and wide standing under the church’s dome, has for decades been held together by a metal frame. Its marble slabs have been weakened over the years in part by daily visits by thousands of pilgrims and tourists. It will be painstakingly dismantled and rebuilt during eight months of restoration work, said the Custody of the Holy Land, which oversees Roman Catholic properties in the area. Broken or fragile parts will be replaced while marble slabs that can be preserved will be cleaned, and the structure supporting them will be reinforced. The work is to be funded by the three main Christian denominations of the Holy Sepulchre — Greek Orthodox, Franciscans and Armenians — as well as public and private contributions. The shrine was built in the early 19th century over the site of the cave where Jesus is believed to have been buried.